We are now at Revelation chapter 22, the last chapter of an amazing book. This chapter gives further description of the eternal home of the saved and of God's plan to dwell with His people eternally. Water is, of course, essential to life and this life-giving water of life is described as coming directly from the throne. A "picture" of this can be seen in the rock in the wilderness of Mt. Sinai that provided water for the Israelites. 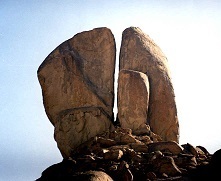 Below are two images of an actual rock near Mt Sinai that could well be this rock. This is an incredible, five to six-story high rock perched upon a hill that is about 200 feet high. There is evidence of erosion by water coming from the bottom of this rock - how could that have happened naturally? This rock is split through the middle and displays the pattern of water erosion and evidence that numerous streams came forth in several directions. Read more here. Further in the description, we will see a river. What is the course of the river? It seems that it starts at the throne (which must be in the city) and has to flow somewhere. Perhaps, like the ancient city of Babylon, the river will flow under the walls. The river described in Genesis, originated in Eden and then split into four. (See also theses verses: Eze 47:1, Zech 14:8, Rev 7:17, 21:6, Psa 36:9, John 4:14). It sounds like the tree is on both sides of the river. When in the month do you suppose the tree yields its fruit? What does "for the healing of the nations mean?" Healing is from the Greek word "therapeia" which sounds like therapy. The curse is God separating Himself from man. God also, in a very real sense, serves man. Could "name" here mean character? Whose name is in their foreheads? - The Fathers. "Night," in this verse, likely means darkness. There will still be day and night in eternity but there will not be darkness. As we noted in chapter 21, there will still be a sun and moon but their light will not be needed to dispel darkness. "Quickly" or "whiles thou art in the way with him." Do not leave it until latter. The angel rejectd John's move to worship him saying "See thou do it not" and identified himself as a fellowservant of John - both are servants of God. Also, he referred to John's brethren as the prophets implying that John also had that role which he most certainly did. He also is a fellowservant of those "which keep the saying of the prophecy of this book." Reader, if you are one who keeps the saying of the book of Revelation then you are a fellowservant with angels of the God of heaven. 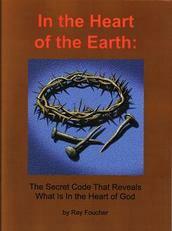 Is Revelation a sealed book? John was told not to seal it. Then it should be understandable and we have made an attempt in this series to do just that. No doubt, there is much more that could be understood and said. These pages will be updated as furhter understanding comes. Go to the next verse of Revelation chapter 22.